Permission is granted to reproduce these articles in magazine, newspaper or newsletter format, provided that credit is given to Share International and clippings are sent to: PO Box 41877, 1009 DB Amsterdam, Holland. Copyright (c) 2007 Share International. All rights reserved. Towards the end of an Age and the beginning of a new Cosmic cycle, everything begins to fall apart. The old and tried ways of living no longer work, or meet the needs of an advancing humanity. Certainty gives way to uncertainty, the known has lost its power to convince, and men feel bewildered, lost and filled with fear. Thus is it today as we stand, baffled, in this transitional phase between the old Age of Pisces and the new Aquarian dispensation. The Aquarian Age will last approximately 2,350 years and will bring much benefit to men as its energies mount in potency over the centuries. However, at present, the old ways of Pisces, outworn but not as yet outgrown, still hold sway and determine the thoughts and actions of the majority of men. This being so, countless millions are held in thrall by the actions of those leaders whose nations are powerful and dominant at the present time. Thus is this a time of upheaval and stress, disharmony and strife. That this troubled time will not last much longer you may be assured. Already, the signs of change are evident to Us, your Elder Brothers. We see clearly the outlines of conditions altogether different from those that now prevail. We see a world at peace, a world where justice reigns, where freedom adorns the lives of men and women everywhere. We know that the present ills are transient and passing, that the time is not far off for the light of the New Dawn to illumine men’s lives and challenge them to action. We know also that men in their hearts are ready and longing for change, and will rise to the challenge with eagerness and will; they await only inspiration and guidance. That inspiration and guidance Maitreya is eager to bestow, in full measure and more, as He awaits the appointed hour which, by karmic law, allows Him to proceed. Then will the Great Lord enter, openly, the domain of men. Then will He challenge the assumptions of the men of power and wealth. Maitreya will speak for the millions without a voice; for the destitute and hungry who live in anguish from day to day; for those who languish in the prisons of the world for daring to challenge the edicts of their ‘betters’. He will speak for all men who love justice and liberty and will raise His voice aloud in their cause. He will temper the wrath of those who govern by war; He will seal for ever the door through which war enters and defiles the realm of man. All this, through men, He will accomplish, and so restore sanity and peace to Earth. Calmly, and with purpose, He prepares the golden future, the inheritance of men, and gathers together the ‘shining lights’, the men and women who will fashion that future. Q. Biofuels are being heavily promoted as a viable alternative fuel source. But biofuels are cultivated at the expense of the local people, their crops, the forests and all animal and bird life in them, the air, the soil and water sources. It seems we are caught on the horns of a disastrous dilemma. Your suggestions or comments please. A. Another wrong decision by humanity, driven, as are most of our decisions today, by market forces (the forces of evil, as Maitreya calls them) in our eagerness to find an alternative to oil dependency. It will take Maitreya to point the way to sanity. Q. It had been thought until recently that humanity had another decade in which to prevent excessive global warming. However, according to Professor Tim Flannery, recent data shows that ­global warming pollutants passed a dangerous threshold in 2005. (1) Is this correct according to Maitreya and the Masters? (2) If humanity embraces the values of sharing and justice will the dangerous aspects of global warming be reversible? (3) Or is it more the case that Maitreya and the Masters believe humanity will be able to adapt to the changed world which global warming will create? A. (1) No. (2) Yes. (3) No. Q. A very recent BBC poll of 22,000 people in 21 countries showed that four out of five people said they were prepared to change their lifestyle in order to reduce global warming and start to save the planet. Would Maitreya consider this as significant enough to warrant His allowing the first interview to go ahead? A. Yes, as soon as possible. Q. Could you please explain what you mean by ‘right human relations’? A. I should have thought that the answer is known to everyone. In every lecture I have given, in every book I have written, I have stressed the need for right human relations and what prevents its establishment. We would have right human relations if we had universal justice and freedom; the end of war and terrorism; if everyone had full human rights according to the UN charter: enough food, shelter, healthcare, work and education as a right, not because we can afford to pay for these things, but because we are human. Q. A building opposite the Basilica of St John the Baptist in Rome (San Giovanni in Laterane) holds a staircase reputed to have come from Pontius Pilate’s palace and to have been used by Christ after His trial. A chapel at the top holds a 6th or 7th century painting on wood of Christ, said to be an acheiropoeton or “not painted by human hand”. Tradition has it that the painting was started by St Luke and finished by an angel and that it arrived miraculously in Rome in 325AD. Over the centuries it has been reworked many times and embellished with silver plating. (1) Is there any truth in the claims about the staircase? (2) Was the painting of the Christ of supernatural origin? (3) Does the reconstructed painting resemble the original? A. (1) No. (2) No. (3) Very little. The original painting was painted by St Luke. In September 2006, co-workers from Salem and Eugene, Oregon, had a booth at the Eugene Celebration. One afternoon, a rather tall youth with blond hair came over to our booth and started pointing at our photograph of Maitreya in Nairobi. He was very excited and said: “That’s the guy! He’s the one I saw in the Old Quarter. Yep, that’s him, with the blue headband. In 2000, I was living in Jerusalem, and there was always this guy hanging around the Old Quarter. He was always by a certain gate, with a flask of water, pouring water for whoever needed a drink. I even drank it myself. And the funny thing was that it was always cold, even in 100-degree weather. Can you believe that? And he was an extremely kind, simple man. There are lots of crazy people hanging around the Old Quarter, but he was different. Maybe he was a prophet. He always gave to the poor around there, always gave some alms or bread to the beggars.” I told him a bit about Maitreya, but he seemed (at that moment) uninterested in the details. “That’s him! That’s the guy! I can’t believe it!” And he walked on. Was the man in the Old Quarter Maitreya? My granddaughter, Nancy, a wonderful, happy girl, developed epilepsy when she was 13 and it gradually got worse. Just before the attacks she used to say “I’m going away for a moment” but over time she was often ‘away’ more than present with us. When she was 15 she was found to have an inoperable brain tumour, which caused epilepsy, and the attacks grew worse and more frequent. No medicine seemed to have any effect. When she was 29 it was decided that although surgery would be very risky it had to be done. The neurosurgeon warned that the operation might leave her unable to speak, possibly paralysed to some degree. Nancy is brave and chose to have the operation. A family member advised us to use Maitreya’s ‘handprint’ to ask for help and healing and we all prayed to the Masters. Nancy kept a card of Maitreya’s ‘hand’ with her constantly – it was her support and comfort. During the 11-hour operation Nancy was brought back to consciousness for two hours so that the surgeons could test her reflexes to see how far they could go to remove the tumour. Those long hours were torture for us waiting. The following day I went to the hospital with a heavy heart, not knowing what to expect. To my surprise Nancy was not in intensive care but in ‘medium care’. The nurse woke her and she gave us a huge smile, fumbled under her pillow and brought out Maitreya’s ‘hand’ card. She announced: “I’m here again and now I’m really totally here.” We were so moved: she was all right, she could speak and move. It was a miracle. The whole operating team also felt the energy, because later the surgeon thanked Nancy and told her that thanks to her strength and energy he managed to remove the tumour and he expressed his admiration for her. On the third day after the operation Nancy was downstairs in the hospital restaurant drinking tea and a week later she was home. Fortunately, none of the terrible outcomes we had been warned about materialized. She’s doing fine. It’s obvious that she’s had an extraordinary experience – she just radiates such love. Did Nancy have the powerful help of Maitreya or perhaps the Master Jesus? Our grateful thanks for all the help we were given. (Benjamin Creme’s Master confirms that Nancy was helped by Maitreya. My husband and I, one of our daughters and our son went to Rome together with friends and their children. As we got off the bus to visit the Vatican, I noticed a woman and her child asleep under the dried-out leaves of a tree. They sat in the little shade the tree provided. The woman leaned against the tree and slept, the baby peacefully in her lap also fast asleep. In front of them was a folded t-shirt with some coins in it. It was extremely hot so I placed my bottle of water next to the woman, in case they were thirsty when they woke up. Then the others also walked over and put money on the t-shirt, which woke them up. The look on the baby’s face when he saw my son was very moving: the baby greeted him as if he was an old friend. The woman’s smile was so loving and she was so modest, almost humble towards them. It was so wonderful to see the joy in the baby and the five children responded with equal joy and love. Sascha, who is seven, gave them her fan – she’d only just been given it by her mother, but she gave it nonetheless. All the time the children touched the baby and the woman held him, so he could stand on his little feet. His enthusiasm was catching. After a while we tore ourselves away from them and sat in the shade of the Vatican square, but as we were leaving I noticed them again, now seated against the wall. 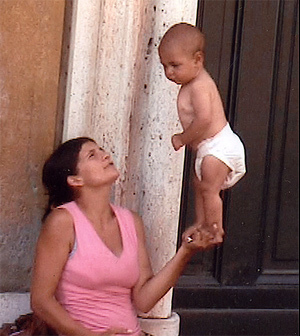 I saw how she held the baby on her hands encouraging him to keep perfect balance. She repeated this over and over again: encouraging him, the boy stood perfectly still for a while, but when he fell down, she kissed him, and encouraged him to stand again. We asked the name and age of the baby: “Seven months old” she replied. The baby was called ‘Lievu’. When we walked away the woman held the baby again on her hand and we captured this on video. All of us are profoundly touched and encouraged by this extraordinary and wonderful experience. Can you tell us if the mother and child were really Masters in a guise? A.van C., Leusden, the Netherlands. My sister-in-law, Jynette and my niece, Beth, also saw the image of an African-American man on television in New Zealand [see November 2007 Share International]. Jynette said it came on during Coronation Street for about 10 seconds at a time and she initially thought it was something happening between the television channels. She said they saw it about six times over two days and that she felt ‘funny’ when she saw the person so she wondered if he could be Maitreya. Was this image seen by everyone watching that particular programme? D. M., Los Angeles, USA. Police in Romania are investigating sightings in September 2007 of a ‘Superman’ figure, dressed in a shiny blue suit, flying through the sky. Around 20 villagers from Gemeni, Mehedinti county, all described the same figure. A disused, rubbish-filled well in Pasir Putih, Malaysia, has been miraculously transformed into a source of crystal-clear, sweet-smelling water with healing properties. Dug by the council in 1980 near the local fish market, the well was abandoned after it was fouled by rubbish and became unfit for use. On 8 November 2007, however, a white light shone from the well, and residents found that the water had become crystal clear and was exuding a sweet fragrance. Market trader Basri Hashim said he was performing the Subuh (dawn) prayers at a nearby surau (Muslim prayer room) when the congregation smelt the fragrance coming from the well. “After completing the prayers, many heard the sound of water gushing in the well. We went and saw that the water was clean and clear,” he said. Since then hundred of people have travelled long distances to visit the well and drink the water, claimed to have healing powers. Some even bring buckets to fill so they can bathe in the water. Journalists visiting a few days after the story broke reported that the water was “clear with a slight, sweet scent”. Pasir Putih district health officers have taken samples for tests. After spinal surgery in May 2006 I went for rehabilitation to the Schlüssel clinic in Bad Peterstal. The atmosphere of the clinic contributed to my well-being: I experienced friendliness and caring about the needs of the patients, a real place for healing. Many patients reported quick healing experiences. At the end of the week I found a cross of light in the glass door of the relaxation room, and after spending an hour in there I became aware that it might be a special room. Who manifested this cross of light and does it speed up people’s healing? At the Karuna Buddhist Centre of Monchique, in Algarve, Portugal, from 29 April to 5 May 2007, we took part in the Yagna (the Vedic ritual of fire sacrifice). Every morning at 6am there was a prayer session to Sri Sathya Sai Baba. I organized it and made sure the room was kept clean so I had to get there at 5.30am to prepare everything: light oil lamps, burn the incense and so on. A Mauritian friend offered to give me a hand. 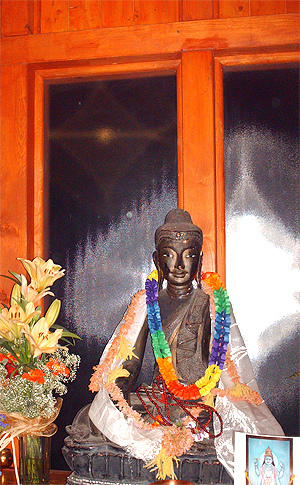 On the morning of third day, my friend who had arrived before me noticed a strange light appearing behind the window where there was a statue of the Buddha. 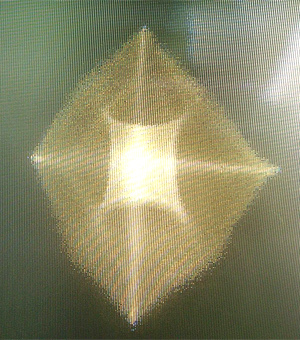 At first I saw a diamond-shaped light, but it was barely visible. Then, the light disappeared slowly to re-appear again – but brighter and brighter. After that it remained fixed. We then started to pray and the light was there until the end of the session to later vanish, little by little. I could not believe my eyes. The next morning when we arrived, the light was already there and stayed until the end of our prayer session. It appeared three or four days in succession, which is why we were able to take some photos. Was this a miracle, and by whom? The Campaign Against Arms Trade (CAAT), a London-based NGO, was founded in 1974 by several groups who were concerned with the growing arms trade following the conflict in the Middle East (the Yom Kippur War) in 1973. Today, CAAT is a wide-ranging coalition of groups and individuals seeking to stop government subsidy and support of arms exports. They promote measures, both nationally and internationally, that will reduce and eventually lead to the end of the arms trade. CAAT also highlights the relationship between international arms sales and global poverty, encourages efforts towards peace, justice and democracy, and supports the resolution of all international conflicts by peaceful means. 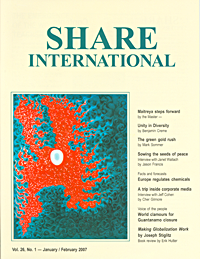 CAAT’s spokesperson Symon Hill was interviewed by Jason Francis for Share International magazine. Share International: How many companies are involved in marketing weapons internationally and how much money is spent on the armaments trade in any given year? Symon Hill: Worldwide, more money is spent on weapons than on anything else – including oil. Global arms spending recently topped one trillion dollars. Literally thousands of companies are involved in the arms trade in some way, but the trade is dominated by a few hugely powerful multinationals such as Lockheed Martin, Boeing and BAE Systems. SI: What is the relationship between individual governments and private companies in the international arms trade? What role do the G8 nations play in the arms trade? SH: The five countries that export the most arms are the five permanent members of the UN Security Council. Arms companies in the US have long been criticized for having too much influence over politicians, not least through campaign donations. Arms dealers also enjoy undemocratic influence in the UK, though the situation is different because the UK’s arms industry is overwhelmingly dominated by BAE Systems. Other British arms companies are smaller and mostly make parts (often to sell to BAE). This makes BAE’s power enormous. The UK’s media reported that the head of BAE had “the key to the garden door” of No.10 Downing Street [the Prime Minister’s residence]. SI: How prevalent is the use of governmental subsidies in the arms trade? SH: Arms companies’ influence on government results in subsidies for the arms trade. Although most politicians in the UK and the US claim to believe in the free market, they seem to suspend this rule when it comes to arms dealers. Many governments offer “export credits” to underwrite private arms deals. Government support and subsidy also comes in other ways. The UK’s Defence Export Services Organization (DESO) is a marketing agency for private arms dealers funded by taxpayers’ money. After years of campaigning by CAAT and other groups, Prime Minister Gordon Brown announced in July 2007 that DESO would be closed. This is a great victory. We will now closely monitor the arrangements that are made as DESO is disbanded. SI: Are military personnel or even diplomatic attachés used to promote arms trading? SH: Yes, frequently. In the UK, government ministers and members of the royal family are expected to promote UK arms on trips abroad, even when the trip appears to have nothing to do with arms or even with trade. SI: What are some of the socio-economic effects of arms spending on the economies of nations? SH: Many of the victims of the arms trade are not killed by weapons. They die because their governments spend money on arms that is desperately needed for tackling poverty and providing healthcare. For example, Pakistan spends more on weapons than on healthcare and education combined. Arms purchases often occur when ministers are bribed into buying weapons they will never need or use. It has been widely alleged that corruption led the Tanzanian government to buy an expensive and largely useless military air traffic control system from BAE in 2002. More developed countries such as the UK waste millions in arms trade subsidies that could be used to fight poverty, improve public services or tackle climate change. SI: What rationale do armament manufacturers and governments use to persuade the public to allow armament sales to continue in spite of their humanitarian and economic impact? SH: Arms dealers often claim to be creating jobs. This is frequently linked with flimsy attempts at patriotism. BAE talks of being a “British company” protecting “British jobs”. In reality most BAE shareholders now live outside the UK and in recent years they have created more redundancies than jobs in Britain. More than 43 million people in 127 countries “stood up and spoke out” against global poverty and in support of the UN Millennium Development Goals (MDGs) on 16-17 October 2007. The worldwide “Stand Up Against Poverty” action was organized by the United Nations Millennium Campaign, the Global Call to Action against Poverty (GCAP), and a wide range of other groups. Millions of people during a 24-hour period gathered in their schools, streets, market places, in front of government buildings and local councils, in workplaces and places of worship, at sports and cultural events and at public landmarks, to demand a more urgent response by governments to the growing crisis of global poverty. • The largest public school system India, the Dayanand Anglo Vedic (DAV) schools, reported that 500,000 school children raised their voices against poverty. At Kashmir University, 35,000 students stood up. • In Bangladesh about 850,000 people stood up, with the main event held at the Dhaka City government office led by the Mayor, followed by a concert. People called for cancellation of debt-servicing to eradicate poverty. Some 1,000 candles were lit to express solidarity with the GCAP movement. • In Pakistan over 3.5 million people took part in events, including thousands in Bahawalpur who helped unfurl a 10km-long banner carrying one million written messages. Pakistan was one of 25 countries using giant banners to form a white band, a symbol of the global anti-poverty movement. • In the Philippines, more than 7 million people attended various multi-faith events including an Anti-Poverty fair. Campaigners called on the Philippine government to change its position regarding the worsening condition of millions of Filipinos living in poverty. • Palestinian children throughout the Occupied West Bank and Gaza spoke out, saying no to poverty. The activities organized jointly with the Palestinian Ministry of Education took place for the first time in public and private schools, as well as UN-sponsored schools. • In Ramallah, a choir from the University performed a new musical work “The Poverty Requiem” as one of a global chain of 20 performances that took place on every continent. A high school choir also performed the piece at the UN headquarters in New York. • In Cairo, Egypt, over a million people supported the “Sailing the Nile” initiative which involved a fleet of eight boats sailing down the Nile with stops in eight Egyptian towns, promoting the eight Millennium Development goals. • In Rwanda, youth groups organized a Stand Up soccer tournament with 20 primary schools. • In Malawi, children were asked to bring a blade of grass to a local football match, and 15,584 responded to the call. • Civil society delegations to government were organized in a co-ordinated global lobby against poverty. Somalia was one of 35 countries where civil society representatives organized a group to present demands for pro-poor policy change directly to their politicians. With Australian greenhouse gas emissions among the world’s highest per capita, marchers across Australia have urged politicians to increase action on climate change and renewable energy targets. On 11 November 2007 marchers thronged cities – 30,000 in Sydney, 50,000 in Melbourne, and up to 150,000 in 50 other towns and cities – in the country’s second ‘Walk Against Warming’. Australian Prime Minister John Howard has aligned his country with the USA in withdrawing from the Kyoto protocol, and in insisting that any global agreement on climate change must include China and India. Now, with a national election due on 24 November 2007, climate change is considered a major issue at the ballot box. Nearly 25,000 of India’s rural poor marched over 200 miles to the Indian capital of Delhi to protest their displacement from lands taken over by industrial projects. Organizers say the protest was a means of demonstrating how India’s rapid economic growth is leaving behind many of the nation’s people. The most comprehensive environmental report ever published by the United Nations concludes that humanity is changing the earth’s climate so quickly and consuming the earth’s resources so rapidly that humanity’s future is at risk unless urgent action is taken. The fourth Global Environment Outlook (GEO-4) report, published by the UN Environment Programme, was compiled over a five-year period by 390 experts and reviewed by more than 1,000 other scientists worldwide. The report concludes that the natural resources that support life on earth have suffered significantly since the first UN environmental report was published in 1987. Called Our Common Future, the report warned about the state of the planet and urged action towards sustainable development. The new report finds that while some steps have been taken since the initial warning 20 years ago, the response to the world’s critical environmental challenges has been “woefully inadequate”, with a failure to recognize the worsening situation. GEO-4 notes that although the overall financial wealth of the earth’s population has increased by about one-third during the past 20 years, most of the increase has been in the developed world, and it has come at an enormous environmental cost. “Much of the natural capital upon which so much of human well-being and economic activity depends – water, land, the air and atmosphere, biodiversity and marine resources – continue their seemingly inexorable decline,” said UNEP Executive Director Achim Steiner at the launch of the report…. To address these crises strong leadership by governments, industry and individuals is needed, the report says. The solutions are available, but the political will to apply them has not been expressed to date. Politicians are fond of telling the general public that they do what we want. This will be good news to all ecologists, activists and those who care about the environment since in at least 21 countries most of the asked 22,000 people said that they are willing to make personal sacrifices in order to tackle climate change. Globescan, a polling company commissioned by the BBC to carry out a survey, found that 70 per cent of the respondents indicated that they were willing to change their lifestyles; this included participants from the world’s two biggest carbon dioxide emitters – the US and China. Globescan interviewed 22,182 people either face-to-face or by telephone in the UK, Australia, Brazil, Canada, Chile, China, Egypt, France, Germany, India, Indonesia, Italy, Kenya, Mexico, Nigeria, the Philippines, Russia, South Korea, Spain, Turkey, and the United States. In general, 83 per cent of respondents in all the countries surveyed agreed that individuals would definitely or probably have to learn new habits and make lifestyle changes to reduce the amount of climate-changing gases they produce. Approximately 70 per cent said they were ready to make personal sacrifices. When asked about fuel costs in the majority of European countries, and in the US, most people said they thought that the cost of fuels (which are responsible for high carbon emissions) would have to increase. The Chinese are the keenest on energy taxes with 85 per cent of those polled indicating they were in favour, putting them 24 percentage points ahead of the next most-supportive countries. When those against energy taxes were asked whether they would change their minds if the tax revenue was used to increase energy efficiency or develop cleaner fuel, large majorities in every country said they were in favour of higher taxes. And again, when people opposed to higher taxes were asked whether they would accept higher taxes if other taxes were cut, so as to keep their total tax burden the same, the poll showed that large majorities in every country favoured higher green taxes. Nordic nations – Sweden, Finland, Denmark, Norway and Iceland – are adding their voice to a growing worldwide consensus by sounding the alarm about an increase in the rate at which Arctic ice is melting: the thaw, caused by global warming, could soon be irreversible. With an eye on the upcoming Bali Conference on Climate Change the five nations (who all have Arctic territories) appealed to all governments to agree as soon as possible to a more far-reaching UN plan to curb greenhouse gases as a follow up to the Kyoto Protocol. “The Arctic and the world cannot wait any longer,” environment ministers from the five nations said in a joint statement after talks in Oslo. “The climate is hurtling towards a turning point after which irreversible processes will have been set in motion,” they said of the Arctic thaw. The ministers pointed up the fact that the ice on the Arctic Ocean shrank to 4.13 million square km (1.6 million square miles) by September 2007; this is the smallest it has been since satellite records began in 1979, and far worse than the low point in 2005. Naturally, the ice is now expanding as winter approaches, but is nevertheless smaller than in previous years. The melt threatens the livelihoods of indigenous hunting peoples and wildlife such as polar bears and seals. The large-scale thaw is blamed by the UN climate panel on heat-trapping gases emitted by burning fossil fuels. Swedish Environment Minister Andreas Carlgren warned that the melting of Arctic ice might already have reached a point of no return. “We may have passed the tipping point,” he said. The United States is heading for bankruptcy, and the leaders are not making any serious attempt to prevent it. The USA is constantly printing money in order to fund the American standard of living and to finance the Iraq war. At present US debt amounts to $9,000 billion. Although everyone understands that the debt will never be paid off, it continues to mount, says financial correspondent Willem Middelkoop. When I make Myself known, I shall express the hope of all mankind for a new life, a new start, a readiness to change direction; to see the construction of a New World in which men can live in peace; can live free from fear of themselves or their brothers; free to create from the joy in their hearts; free to be themselves, in simple honesty. Consider this: “Take your brother’s need as the measure for your action, and solve the problems of the world. There is no other course.” Into your unhappy world now steps Maitreya. He knows your agony and suffering better even than you do yourselves, for He knows, too, the joy which is your birthright. That joy would He restore to you in full and perfect measure. For that is He among you. When you see Us you will know that the New Time, the New Age, has begun – the time of Sharing and Justice, of Love and Brotherhood, the time of the Law of God. I am the Instructor of this New Time. I shall release to you That which will take you quickly home. I shall give you these instructions which will release in you your divine nature. From My Brothers will flow a stream of creative fire which will light your lamps and carry you brightly to God. My Masters know naught but Love and Joy. Likewise, My friends, this will be your heritage. Make haste to claim your rights, and know the Love and Joy of God. Enjoy life – “Remain open-minded. Enjoy life. When you enjoy life, it is as if you are sitting on the beach looking at the vast ocean. At that moment you experience serenity, tranquillity, detachment within. You do not think of your bank account at that moment. Nobody lectures you at that moment. The gift of life flowers within you. Happiness – Human beings are looking for happiness such as is found in the lap of the mother. You will find happiness when you begin to realize that the Almighty is always with you, 24 hours of the day. Then you will experience freedom from within. There is no room then for unhappiness, greed or anger. It is essential that all men share in this experience and learn the art of living. Until now, a truly creative life has been the privilege of the few. In this coming time the untapped creativity of millions will add a new lustre to the achievements of man. Emerging from the darkness of exploitation and fear, in true and correct relationship, each man will find within himself the purpose and the joy of living. There is only one way to God and that, My friends, you already know. The way to God is the way of Brotherhood, of Justice and Love. There is no other way; all is contained therein. If something good, nice, pleasant happens you feel happy, but you were not happy before and you may not be happy tomorrow, so the feeling of happiness is not the Self. The nature of the Self is not happiness, but it is continuous, unbroken joy; it never changes. Or something nasty and painful happens and you are miserable, have a sense of loss, pain, disillusionment, depression. What has happened to that happiness, where did it go? Neither the pain nor the happiness is anything to do with the Self. These are the experiences of the man or woman in incarnation, the physical, mental, emotional vehicles of the Self. The Self itself knows none of that; it has no emotions, no thoughts, it alone is, it is Being, manifesting through physical body, emotional structure, mental body. These are vehicles for the Self to experience at this level. When you are detached, the Self can go in and out of these at will. It can use these vehicles but does not get attached to them. Few today can envision a world in which trust truly reigns. Few there are who can visualize the calm, experience the beauty, of such a time. Let your imagination conjure a world free from fear and crime, competition and greed. Open your mind to the concept of universal justice and peace, manifested joy.